Toy haulers are becoming more popular as more people wish to bring along “their toys” to the campground. 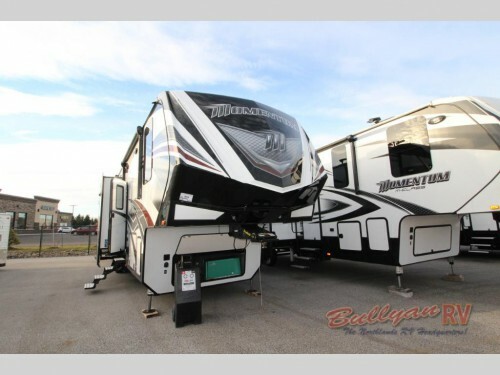 With two slide outs, the Grand Design Momentum 399TH toy hauler fifth wheel has more than enough room to bring along everyone in your family as well as kayaks, ATVs, golf carts, or any other outdoor toys you want! 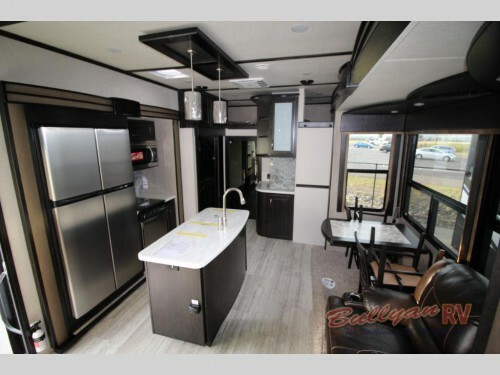 Check out the Grand Design Momentum 399TH toy hauler fifth wheel! The 13’ rear garage comes with a ramp door that will be aid you in loading and unloading these toys. It’s enclosed design will keep these toys safer and more secure when in transit, and then when they have been unloaded, this space can be converted to another spot for people to sleep with the overhead loft, extra half bath, and LED TV. Plus, the additional entry door will make accessing this area easier, and the fold down, side patio gives you another great space for enjoying the outdoors. Add protection for your outdoor toys and extra sleeping space in the convertible cargo area. The living room and kitchen areas will have one of the two slides to give you a spacious area to walk around the Grand Design Momentum. Inside the slide will be a free standing dinette and a set of two theater seats with the option of having a super sofa instead. No matter what furniture you get, each piece will have a perfect view of the LED TV and fireplace located here! The large slide makes more space for high quality features. You will also find some of the highest quality kitchen amenities in the Momentum 399TH. All of the appliances will be stainless steel including the 18 cu. ft . refrigerator, and the additional center island with double sink will give you more prep space to make cooking easier. Upgrade to a king in the master bedroom for added comfort. The front master bedroom will come with a standard queen size bed with the option of upgrading to a king if your desire. The second slideout will be located here to add space for a closet, and with dual nightstands on either side of the bed, you will have plenty of space to keep all of your belongings organized. 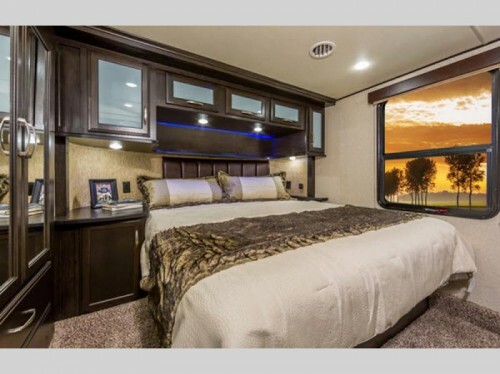 Take fun and luxury with you on your RVing trip in the Grand Design Momentum 399TH toy hauler fifth wheel. 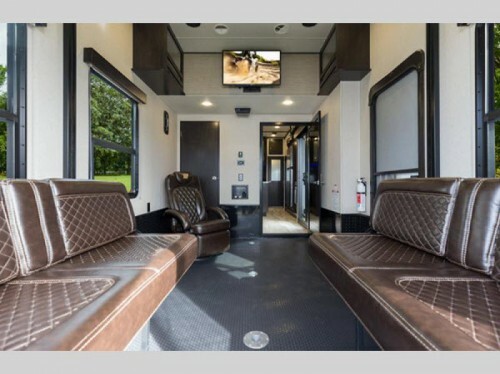 Be sure to contact us to find out more about this incredible camper, or just come on by our location to take a look at this or any of our other toy haulers, motorhomes, travel trailers, and more!